Just Create: What are the Page Rates to do Comic Books? 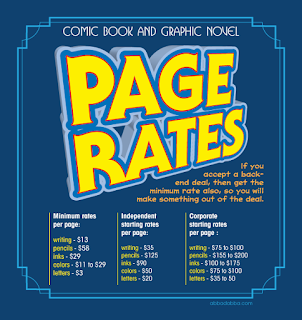 I’ve covered the various scenarios talent can find themselves positioned in the comic book industry and the page rates. That is corporate, small press. self-publisher and independent publisher. So let’s review before we go further into the business of comic books and graphic novels. Based on a 22 page comic book. Everyone deserves to make at least minimum wage for their services; writer, artist, colorist, letterer and any other job in America. Not only deserves, it's the law. Regardless of skill level. previous - Do You Really Want to Create Your Own Work and Self-Publish?